Marks, Thomas Architects has been recently awarded the 2013 Brownfield Renewal Award/Sustainability Impact Category for Union Mill. Our revitalization of this mixed-use property has created stellar impact within trending historic national renovations. Completed in January 2012, the 86,000 SF development includes 54 residential units targeted to teachers who are new to Baltimore, including Teach for America participants; 30,000 SF of office space designed for non-profit organizations and exceptional amenities including a lush half-acre central courtyard. Tenants such as these are bringing valuable resources, services and outcomes to Baltimore’s underpinning health and human service needs. In addition to creating jobs, the building’s ability to provide organizations and individuals with smart, environmentally sound space to live and work allows them to focus on what they do best. The collaboration of like-minded people all in one building encourages positive thought and creative ideas that ultimately make our city a better place. 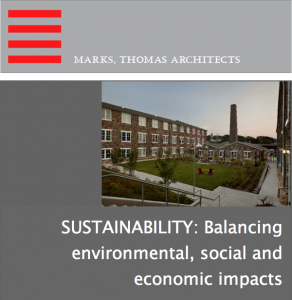 At Marks, Thomas Architects, we are committed to integrating sustainability as a core value in our endeavors. Balancing environmental, social and economic aspects of sustainability were key in the redevelopment of the Union Mill project. Marks, Thomas Architects has been recently awarded the Sustainability Impact Category for Union Mill. Our revitalization of this mixed-use property has created stellar impact within trending historic national renovations. Please visit Marks, Thomas Architect website to view this project and other achievements. Allen & Shariff was responsible for the LEED MEP engineering design, Energy Modeling and Pre-Requisite Commissioning services for the Union Mill Projects.